A group of people, dressed in ANC attire, threw petrol bombs at police at the corner of Miriam Makeba and Fox streets in Johannesburg following a march by the DA on Wednesday. A Sapa reporter at the scene said at least four petrol bombs were thrown at police near the Johannesburg Magistrate's Court. Around 100 officers descended on the street to try and restore calm. The violence in central Johannesburg resulted in DA supporters being re-routed back to the Westgate transport hub. 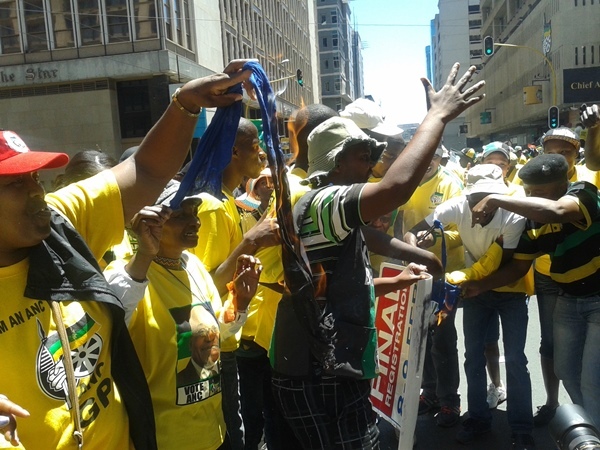 Police fired three stun grenades at a group of people in African National Congress attire on Rissik street that were seen running towards the marchers. DA Gauteng premier candidate Mmusi Maimane told reporters that members of the ANC had thrown stones at them. The Democratic Alliance members were marching for "real jobs".